This page presents the Smart Limerick Roadmap as a comprehensive portfolio of 10 programmes developed in consultation with the Limerick Digital Leaders Network and the Council Digital Champions Forum between December 2016 and April 2017. The roadmap has been defined with the aim of increasing Limerick’s level of digital maturity by 2020 and setting the foundation for Smart Limerick City Region and Communities. 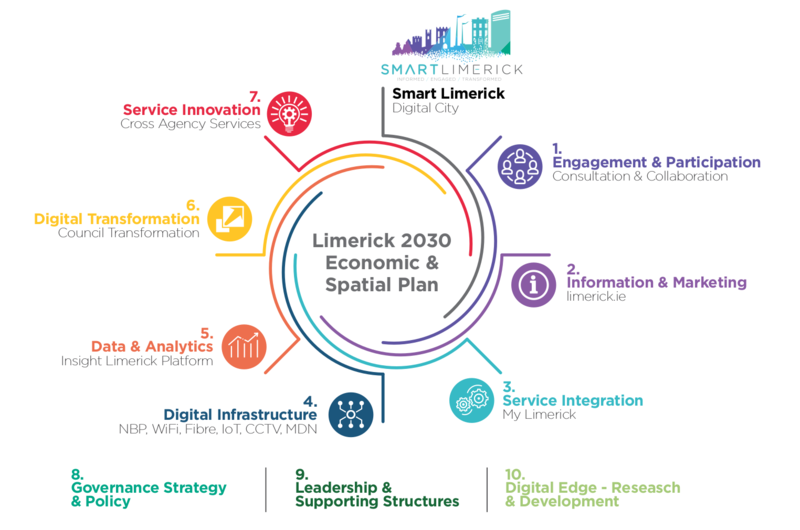 The Limerick Digital Strategy puts a new lens on Limerick’s strategic development and especially on the ambition to transform our economy and physical space under the Limerick 2030 Economic and Spatial plan Limerick 2030 an Economic and Spatial Plan for Limerick. The Strategy defines a framework that supports and enables the use of digital technologies and the adoption of digital transformation principles across the economic, social and physical domains of Limerick City and County. The Limerick Digital Strategy aims to lay the foundation for the “Sustainable Smart Limerick City Region and Communities”, a Limerick that uses digital technologies and embraces new work practices to empower communities, create better services, accelerate sustainable social and economic growth and to improve the quality of life for all. This cannot be done in isolation by an individual or a team, not even by a single organisation. It can only be achieved through collaboration across communities and agencies. It requires collaborative leadership and a readiness to challenge the status-quo with a transformational mindset. This will be achieved by implementing a portfolio of 10 programmes that are lead by the Digital Leaders Network and the Council Digital Champions Forum. The strategic approach (consisting of seven operational programmes and three supporting programmes) is described below.